Maxwell House and Nescafe has been around for quite some times. People have enjoyed their products since decades ago and they are still popular until now. For those coffee lovers out there, we will compare both of them and provide you with some brief information to help you decide, which one will suit your taste better. Maxwell House is a brand of coffee and is a part of Kraft Heinz. Kraft Heinz is an American company that was formed by the merger of Kraft Foods and Heinz in 2015. The Maxwell House brand was introduced in 1982 by Joel Owsley Cheek and was named to honor the Maxwell House Hotel in Nashville, Tennessee. The brand was being one of the largest selling coffees in the United States until late 1980s. The product is manufactured in Jacksonville, Florida. Maxwell House has many different varieties in their product diversity. In the ground coffee they have Maxwell House 100% Original Ground Coffee, 100% Colombian Ground Coffee, Breakfast Blend Ground Coffee, Daily brew Ground Coffee, Dark Roast Ground Coffee, Decaf Original Medium Roast, French Roast Ground Coffee, Gourmet Roast Ground Coffee, and Hazelnut Ground Coffee. Aside from those mentioned above, according to kraftrecipes they also has House Blend Ground Coffee, Intense Bold Ground Coffee, Lite Ground Coffee, Morning Boost Ground Coffee, Original Roast Ground Coffee, Original Medium Roast Ground Coffee, Smooth Bold Ground Coffee, Vanilla Ground Coffee, and Wake Up Roast Ground Coffee. Among those varieties, the most famous one is the Original Blend Ground Coffee. The Maxwell House Original Ground Coffee has a rich and classic, medium roast signature coffee that was made with a blend of Arabica and Robusta Coffee beans. This variant is available in 30.6 oz. canister, 11.5 oz. canister, and 11.5 brick. Nescafe is a coffee brand by Nestle, which first introduced in Switzerland on 1 April 1938. The Nescafe name is a portmanteau of the words “Nestlé” and “cafe”. The product was first developed by Nestle in 1930 at the initiative of the Brazilian Government to help preserving their Brazilian coffee harvest annual surplus. Not long after, the brand became a soluble powdered coffee that used in American staple during World War II. In the United States Nestle introduced Nescafe with other name and sold at higher price, which is the Taster’s Choice. Read our other review on Folgers vs Starbucks here. Nescafe has so many different variants and some of them may be available or not in some countries. One of the most popular products from Nescafe is the Nescafe Clasico that was made from 100% pure coffee from selected beans and was carefully crafted to get its full flavor and aroma. Nescafe Clasico is unique and has the similar taste of “cafecito” that is famous among Latino consumers. Nescafe Clasico is well-crafted to suit the taste of Latinos in the U.S. This variant is available in 1.75 oz., 3.5 oz., 7 oz., and 10,5oz. sizes. It also available in 7 counts stick pack, which is suitable to carry it on the go. For those who avoid caffeine, Clasico has another variant that has no caffeine or the decaf version. - Mellow & Smooth. Masterfully Roasted. - Makes up to 210-6 fl oz cups. - Carefully roasted to capture its full flavor and aroma. 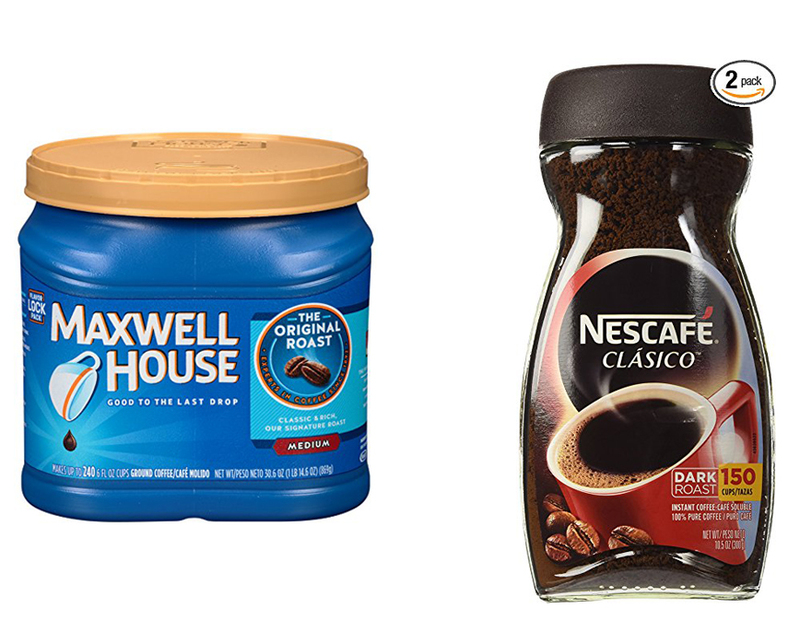 When comparing both of Maxwell House and Nescafe, we may lay our preference on one side or both sides. Both of Maxwell House and Nescafe have their own unique taste and both also has a long history with their products. If we are going to compare them based in their popular variant, which are Maxwell House Original Blend and Nescafe Clasico, we may take notice on their roast level. Original Blend by Maxwell is Medium roast, while Nescafe Clasico is a dark roast. For those who prefer their coffee to be dark and full-bodied, we recommend you the Nescafe Clasico.